Never mind simple spy photos – by now even the spy video footage is out, and the world has seen what there is to see of the forthcoming five-passenger “estate” car from Mini, at least in its current form. Changes are expected, but for now this is how it looks. 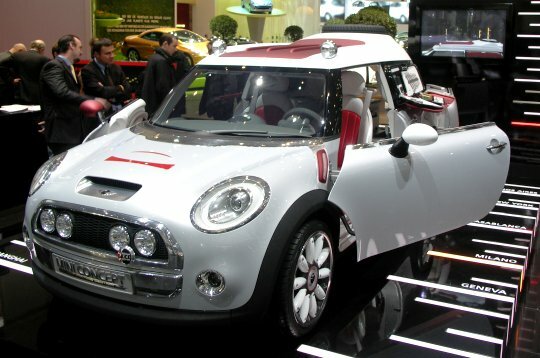 The Mini Traveller concept car, which first showed its adorable frog-eyed face at the 2005 Frankfurt Motor Show, is an ever-evolving modern interpretation of the Morris estate cars of 1960s Britain. BMW owns the original Morris manufacturing plant, where it builds its Mini cars today. The difference in size from the Cooper is said to be 18 inches overall – nope, not quite enough to call for installation of a rear-obstacle detector. Still, this space will make a huge difference in cargo capacity and may even allow Mini to claim it offers a family car. Although the original Travellers often sported exterior wood, you shouldn’t expect that of the forthcoming Mini version. In fact, the concept car that appeared at the 2006 North American International Auto show in Detroit was outfitted with a stainless-steel roof rack (complete with token snowboard to appeal to the tres-young-and-cool car-buying segment). The Geneva Concept Traveller also appeared in 2006 at the Swiss city’s auto show. No matter what accessories may end up on the outside of the Traveller, it’s the formation of the basic glass and sheet metal that grabs one’s attention. It looks much like the original, but in reverse, with an extended driver’s-side window uninterrupted by a B-pillar, and a “suicide” door on the passenger side, complete with B-pillar. Another retro element is around, at least for the time being, as well: split rear barn doors – with their hinges forward of the taillights – in lieu of a hatchback. The rumor mill buzzes with word that parallel sunroof panels may serve as a completely modernizing feature. Other 21st-century quirks that exist for now are the swiveling front seats with their centered (and thus hidden) mechanisms, and a hovering/revolving speedometer that moves as the needles stays put. Aside from some of these interesting elements possibly vanishing from the production Mini estate, the Traveller name itself may say cheerio: ownership of that name has not been clearly determined, so it may not in fact be available for use by BMW and Mini. Look for the Traveller – or whatever it will be called – at your Mini dealership by 2009 at the latest. It’s expected to use the Cooper’s current 1.6-liter, four-cylinder engine, and there may be a turbocharged version. This entry was posted in Classic & Vintage Cars, Foreign Cars, United States. Bookmark the permalink.